I’ve been back in LA for some time now since I last posted and I apologize for the lull in content. I’ll be getting back on track here shortly as I have more photo sets to post soon. This post goes out to the rule breakers, the ones with a little more fire than the next, the ones who were bold enough to go after what they wanted to do and did it well. 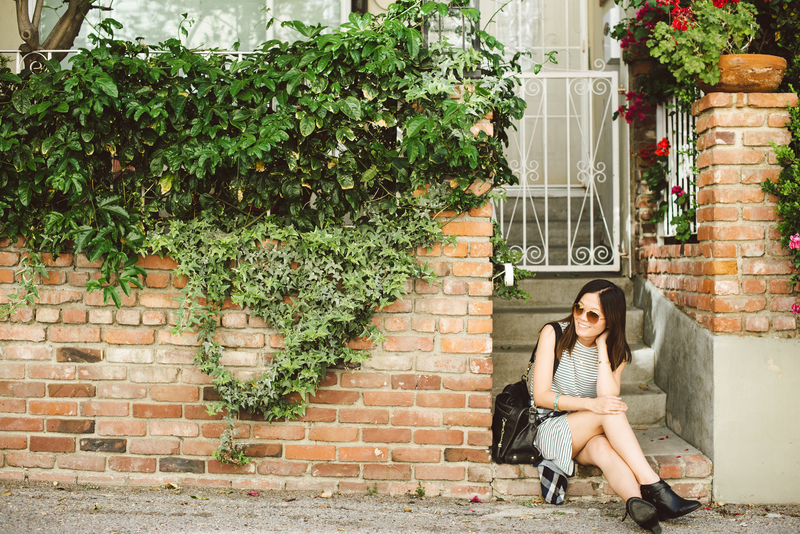 My photographer friend Hannah Gweun graciously came to shoot with me in my neighborhood of Sherman Oaks recently. I met Hannah a while back on a film set we both were working on and she’s a stellar photographer and even more human being. I say that because she, like myself is dedicated to her craft in a city that will unapologetically overlook it. But yet we try try again. In essence, Hannah and I have earned our stripes, whether or not the industry will honor that we may never know. Whatever it is you’re doing or pursuing, do it with full speed and tenacity or not at all. I’m loving the stripes and plaid together. Really great effortless looking outfit! In love with the dress and those booties! Right up my alley. you look super chic lauren! 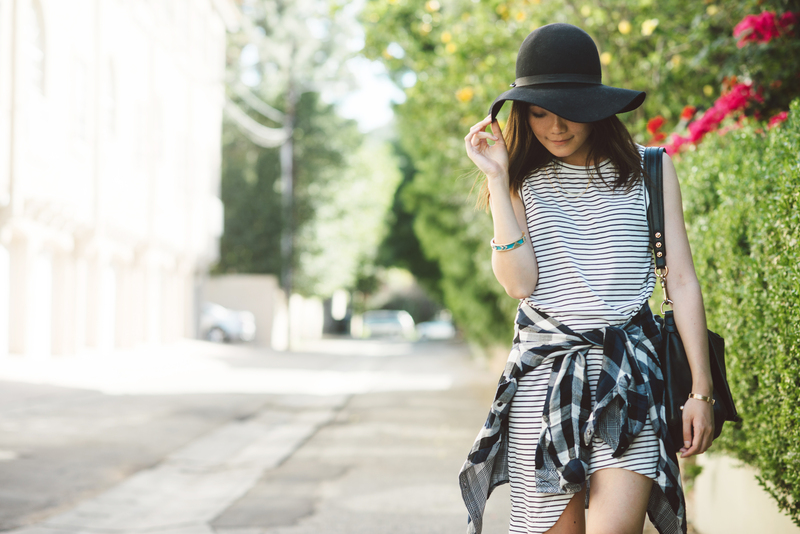 i love the mix of checks and stripes paired with amazing accessories! where’dja get the cute hat?! 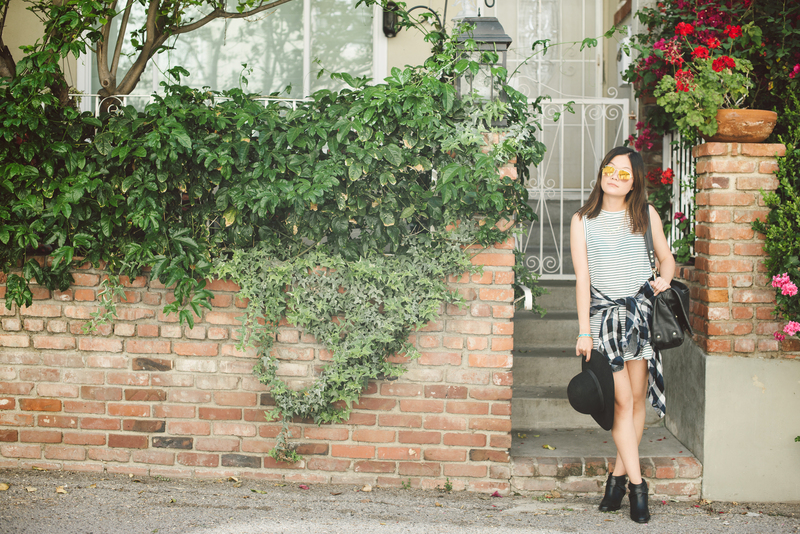 Love the stripes + plaid shirt tied around the waist; such an effortless look! You look amazing! I adore this outfit, especially those booties. Lovely post and gorgeous pictures! Very cute! I love stripes, I could wear a striped item everyday! This is such a great outfit, i love the plaid tied around the waist paired with the stripes. Great photos too, your friend is talented! Love this look!!! It’s so stylish and comfortable. Quintessential LA!